Goldstone is a beautiful man made glass that comes in a range of different colours – reddy brown, dark blue, and a dark green. 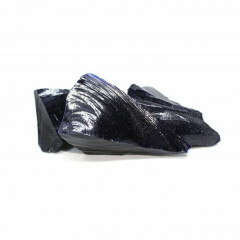 Goldstone is an interesting man made glass which is created in blue, red, and green. It is often sold polished, as tumblestones or carvings or jewellery. The rough pieces are not especially common but can be purchased for lapidary – although precautions should be taken as they are a form of glass. The glass is created by mixing glass and metal in an oxygen reducing furnace atmosphere; crystallisation allows the metal to become shiny inclusions in the glass itself. Red and Blue Goldstones are the most common, and contain Copper and Cobalt respectively. Green Goldstone takes its colour from Chromium oxides. While one manufacturing process for Goldstone was invented in Venice in the seventeenth century, there is archaeological evidence that it was made in the 12-13th Century in Iran. Goldstone consists of normal silica glass with metal inclusions – Copper oxide, Cobalt, Manganese, or Chromium Oxides. It measures around 6 on the mohs scale, depending on manufacturing method, and has a specific gravity between 2.50 and 2.80. If you’re interested, you can read this 19th century recipe for the glass. Goldstone is a man-made glass and as such doesn’t really have a ‘locale’. Historically, it was made in Murano and Venice, in Italy. In the modern day, I’m actually having trouble finding any information but we can assume production has likely moved East, probably to China. Well – Goldstone is a glass, and there are some inherent dangers to glass. If you buy rough specimens, they’ll definitely have some very sharp edges, same as if the glass is broken. Lapidarists, cutters, and polishers should be careful too. Silica dust inhalation can cause silicosis, a very unpleasant condition. One popular name for this material is ‘Aventurine Glass’. It is also sometimes known as Sandstone when used in watches. The colours are also referred to – we have red Goldstone, brown Goldstone, blue Goldstone and green Goldstone. As a man made glass, many crystal healing practitioners claim Goldstone does not hold any power, although others do. Many of the others believe the glass can hold the powers of the metal inclusions – red Goldstone would have the powers of Copper, etc. Ultimately, all we can say is, if the piece feels or looks right to you, if it draws you in, it is the piece for you. 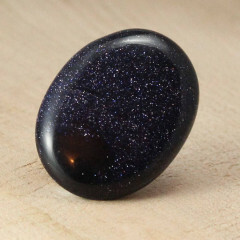 People believe that blue Goldstone can be used to transmit healing energies, and help to soothe sensitivity. Because of this, its thought to be a great piece to give to empaths. Red/Brown Goldstone has Copper inclusions, and is thought to carry many of the properties of the element. It may help to generate and cleanse energy fields, and divert negative energies into the Earth. It is also believed to help the circulatory system. As Goldstone contains metal inclusions, it should never be left in contact with liquids. Some people say brown/red Goldstone is helpful for the sacral chakra due to the colour of the material. Others believe it can be used with the Root chakra. 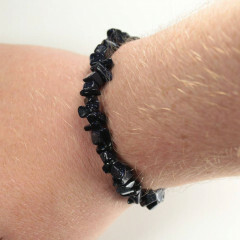 Blue Goldstone, however, is usually associated with the heart, throat, and crown Chakras. 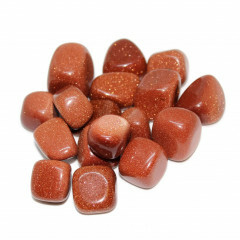 Most sources seem to suggest Goldstone is perfect for Sagittarius.